The new pages are not intended to change district policy in any way. Schools will still be bound by current policy and quotas. The process of requesting student classes will simply be moved to from paper to the computer. A signed referral for will still be used as a student contract and school notification. A new form showing actual classes is available and will be modified to meet the needs of councilors and administrators. A sample is included below. When a school administrator determines a Focus Center Referral is the appropriate educational choice for a student the school counselor drops the students current classes and enrolls them in Focus Center Classes that will provide a graduation path for the student. The process of entering students in class at the Focus Center is the same as entering students in classes at any other school. The process was explained at counselors meeting and there is a guide on the PS Train Site. After the Focus Center classes are added the referral form can be printed, credit goals entered and signatures added. Images of the PowerSchool Screens are included below. After selecting the student choose functions from the student menu on the left. 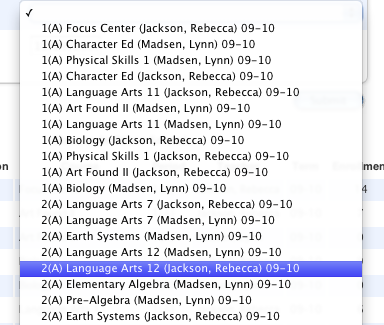 Then select Enroll In A Class at another School from the functions list. Choose Focus Center from the pull down menu and click on the submit button. The list shows all classes offered. 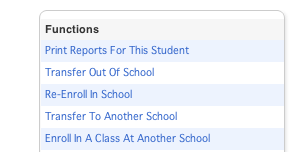 Make sure to check class size and Teacher Name before select the class you wish to add for the selected student. Make sure to enroll each student in a Character Ed Class with your assigned Focus Center Instructor. These classes will be used to call roll. When you are ready select the class to add form the pull down and click on the select button. Repeat the process until you have added the appropriate classes. Print the Focus Center Referral form and follow current policy to complete the process. 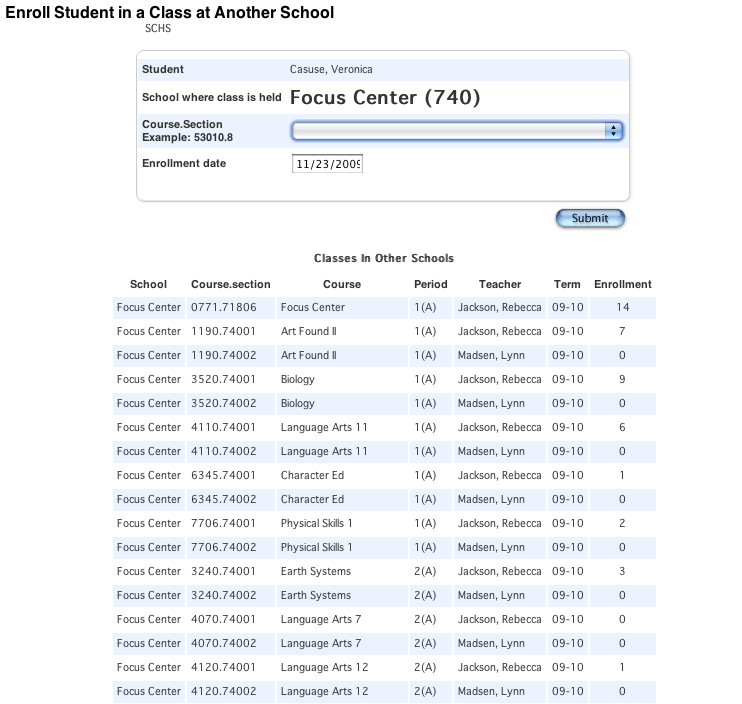 As soon as the student has been added into a Focus Center class their PowerSchool information will be available to the Focus Center staff using the Students From Other Schools function from Other Options on the PowerSchool Home Page. The classes at the Focus Center became the link that joins the home school with the Focus Center allowing both schools to access the student and monitor their progress.